SANAA/ADEN, Yemen (Reuters) - Yemen's President Abd-Rabbu Mansour Hadi left his refuge in Aden for Saudi Arabia on Thursday as Houthi rebels battled with his forces on the outskirts of the southern port city. "My whole family and I are preparing to sleep in the basement, as it's the safest part of the house," said resident Fawzia Nedras. "The windows are rattling and we think they may break. We live near the airport, where we think a lot of the Houthi leaders are living and many of the air strikes are." Houthi leader Abdel-Malek al-Houthi said in a televised speech Yemenis would confront the "criminal, unjust and unjustified aggression" by Saudi Arabia. Residents and security officials said the second night of air strikes throughout Yemen targeted air and ground force bases loyal to ex-president Ali Abdullah Saleh, whose forces have bolstered the Houthi advance. The Saudi-led military intervention marked a major escalation of the Yemen crisis, in which Iran supports the Shi'ite Muslim Houthis, and Sunni Muslim monarchies in the Gulf back Hadi and his fellow Sunnis in Yemen's south. Iran denounced the surprise assault on the Houthis and demanded an immediate halt to Saudi-led military operations. Tehran also made clear Saudi Arabia's deployment of a coalition of Sunni states against its Shi'ite enemies would inflame the sectarian hatreds already fuelling wars around the Middle East. Hadi's departure under Saudi protection from Aden, his embattled base since fleeing Sanaa in February, could be a turning point. Saudi state news showed pictures of Hadi smiling and holding hands with the Saudi defense minister receiving him at an airport in the capital Riyadh and said he would go on to Egypt to attend an Arab summit on Saturday. Mohammed Marem, the director of Hadi's office, confirmed he would attend the meeting in person, dropping his original plan to address it via video link. Hadi would seek a "Marshall Plan" from Arab leaders to aid his war-torn country, his foreign minister Riyadh Yaseen told pan-Arab Al Jazeera TV, referring to a major economic stimulus for Europe after World War Two. It was far from certain whether Hadi would be able to return to Aden. On the city's northern outskirts, Houthis and allied troops fought gun battles with militiamen loyal to Hadi. 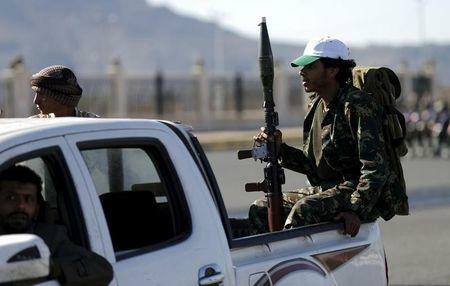 Thirteen pro-Houthi fighters and three militiamen were killed and several others were killed in running street fights in nearby towns. Pro-Hadi fighters retook Aden airport, a day after it was captured by Houthi forces. The facility remained closed. The Saudi move was a major gamble by the world's top oil exporter to check Iranian influence in its backyard without direct military backing from Washington. 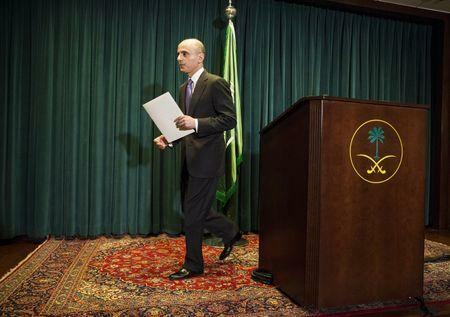 "We will do whatever it takes in order to protect the legitimate government of Yemen from falling," Saudi Arabia's ambassador to the United States, Adel al-Jubeir, told a news conference in Washington. In Sanaa, which the Houthis seized in September, warplanes earlier bombed the main airport and al Dulaimi military air base, residents said. A Reuters witness said four or five houses had been damaged. Rescue workers put the death toll at 13, including a doctor pulled from the rubble of his clinic. 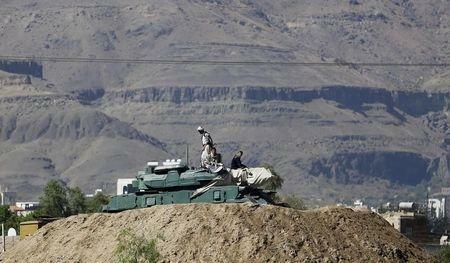 Warplanes also struck Houthi fighters near Yemen's border with Saudi Arabia, tribal and Houthi sources said. There was heavy street fighting in Houta, north of Aden, in which five pro-Houthi fighters and four militiamen were killed. Thousands of Houthi supporters gathered to condemn the air strikes at the gate to Sanaa's old city, waving Houthi banners and chanting "Death to America!" "It is really not possible to tolerate this. Iran has to understand," he said, adding Tehran should withdraw any forces it had in Yemen as well as from Syria and Iraq. Pakistan's Prime Minister Nawaz Sharif said any threat to Saudi Arabia would "evoke a strong response" from Islamabad. "There are no plans at this stage for ground forces operations, but if the need arises, the Saudi ground forces and those of the friends and sisterly forces are ready and will repel any aggression." Arab foreign ministers agreed in Egypt on Thursday on a draft resolution to form a unified Arab military force. "The task of the force will be rapid military intervention to deal with security threats to Arab nations," Arab League Secretary General Nabil Elaraby said. Russia's President Vladimir Putin called for an immediate cessation of military activities in Yemen in phone conversations with Iran's President Hassan Rouhani, the Kremlin said. U.S. Secretary of State John Kerry raised Yemen on Thursday with his Iranian counterpart before turning to nuclear negotiations in Switzerland. Iran's Foreign Ministry demanded an immediate halt to the "aggression and air strikes" in Yemen. "Military actions in Yemen ... will further complicate the situation," ministry spokeswoman Marzieh Afkham said, quoted by Fars news agency. A senior Iranian official told Reuters: "Iran will use all possible political ways to allay tension in Yemen. Military intervention is not an option for Tehran." Riyadh accuses Iran of stirring up sectarian strife throughout the region and in Yemen with its support for the Houthis. Iran denies funding and training the Houthis. Ambassador Jubeir said the assaults were in response to a request by Hadi. Washington said it supported the operation and had authorized U.S. logistical and intelligence support. A widening Yemen conflict could disrupt the narrow Bab el-Mandeb strait, through which nearly 4 million barrels of oil are shipped daily to Europe, the United States and Asia. Oil prices surged as much as 6 percent on Thursday. Yemen closed its main ports. The U.S. military said it would help ensure the strait at the tip of the Red Sea remains open.